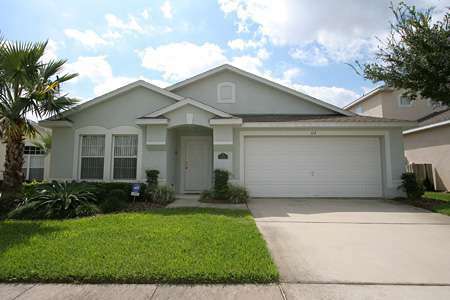 Exexutive 4 bedroomed 3 bathroomed Villa with extended Pool, Deck, Spa and Games Room in Hampton lakes right off 192 near Disney. The first master suite has a king sized bed and large en-suite with bath / shower, toilet, double basins, vanity unit, mirrors and hair dryer. There is a linen cupboard with a large supply of all linen and towels. There is a phone, clock radio and TV. There is a large walk in closet for storage which also contains a safe. A window offers a view of the pool. The second master suite at the front of the villa has a queen sized bed. There is en-suite with bath / shower, toilet, wash basin and hair dryer. The suite has a large built in wardrobe and drawers, TV, phone and clock radio. Bedrooms three and four have full sized twin beds, fitted wardrobes and drawers. These bedrooms share a third bathroom and are next to each other down their own hall way. They are tastefully decorated to suit either children or adults. The Pool The large 30” south facing pool and spa affords all day sunshine. It is fully screened by fine mesh for your added comfort preventing insects and debris from entering the area. This does not however affect sunbathing. The pool is surrounded by a huge patio deck and there are plenty of luxurious sun lounges, chairs, two dining sets with umbrellas. Beach towels are provided. The deck can accommodate two families with ease. The pool is private and neighbouring properties are screened by trees and shrubs. Pool and outdoor lighting make it perfect for dining alfresco on warm Floridian evenings. There is an abundance of outdoor crockery to perfect the occasion. A BBQ area is available. 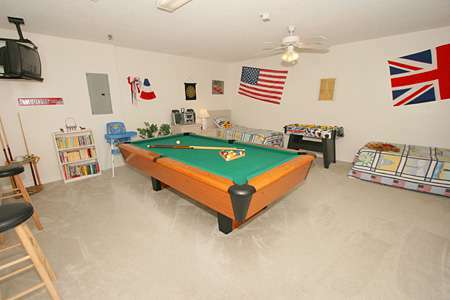 Games Room The large two car garage has been converted into a fantastic games room to add to your holiday enjoyment. It is complete with full sized pool table, table football, TV, PS2, electronic dart board, plenty of board games and books. There is Internet access, but you will need to bring your Laptop. The room is fully carpeted, air conditioned and has the advantage of two further single beds, fitted wardrobe and drawers. This could be used as a fifth bedroom but has no window. Resort Zuschläge können sich jederzeit ändern. Eine $40 Service Gebühr wird einmalig erhoben. • 25% Anzahlung bei Buchung (minimum $300). Anzahlung wird bei Stornierung seitens des Kunden nicht erstattet. • Der Gesamtbetrag muss 8 Wochen vor Reiseantritt bezahlt sein. • Wird der geschuldete Betrag nicht innerhalb der Fristen bezahlt kann der Inhaber unter Einbehaltung bereits gezahlter Betraege den Mietvertrag kuendigen. • Es wird eine Kaution ($500) mit der letzten Zahlung erwartet. • Einchecken ab 16:00 Auschecken bis 10:00 möglich. Abweichende Zeiten auf Anfrage. • Alle Preise sind Tagespreise und können ohne Voranmeldung geändert werden. Wir benötigen Ihr An- / Abreisedatum um einen Preis zu ermitteln. Klicken Sie bitte hier zur Datumseingabe. Alle Entfernungen und Fahrzeiten sind unter Nutzung von google maps ermittelt worden. Unsere Erfahrung jedoch hat gezeigt, dass die Reisezeit bis zu 10 - 15 Minuten weniger sein kann. Der SPA (Whirl-Pool) dürfte etwas länger in Betrieb sein, damit man sich auch abends darin erholen kann. Ansonsten war die Wahl für FloridaBestVilas die Richitge. Der Aufenthalt hat uns sehr gut gefallen.